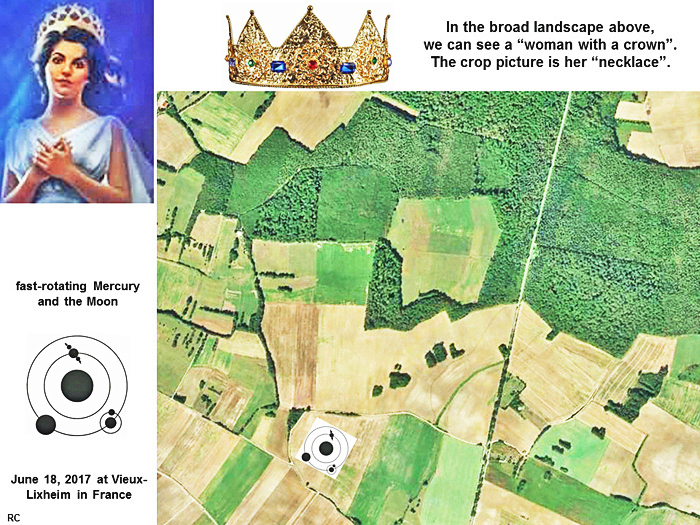 Might these striking images of a “woman with a crown”, seen in the broad landscape above a new crop picture at Vieux-Lixheim, be meant to suggest a “woman with a crown of 12 stars” from the Book of Revelation, Chapter 12? Some kind of “radiant person” (man or woman) was likewise suggested by a crop picture near Cerne Abbas on May 22, 2017 (see Cerne Abbas Articles). 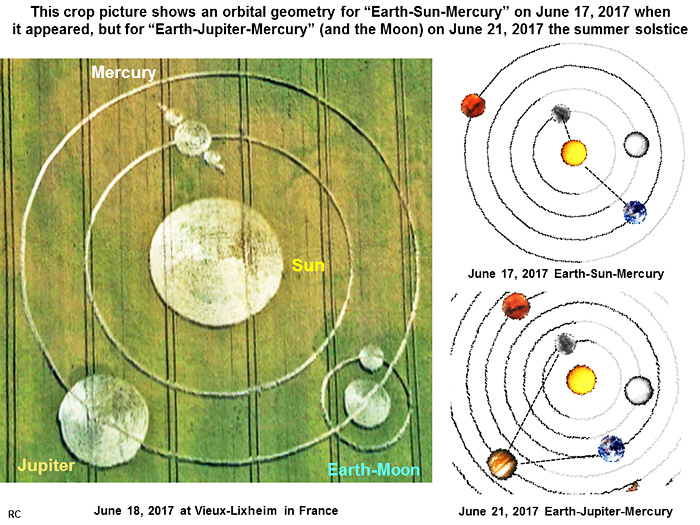 Other landscape symbols suggest that a “spinning wheel of planets” (which has the shape of a “triangular pyramid”), as drawn in crops, may be rolling into the constellation of Leo the “lion”, just as our Sun will move into that constellation by August in Earth’s sky. Please see a “lion’s head and face” on the left, which is complementary to that “woman’s forehead and face” on the right (in the slide shown above, or in another slide posted further above on this page). 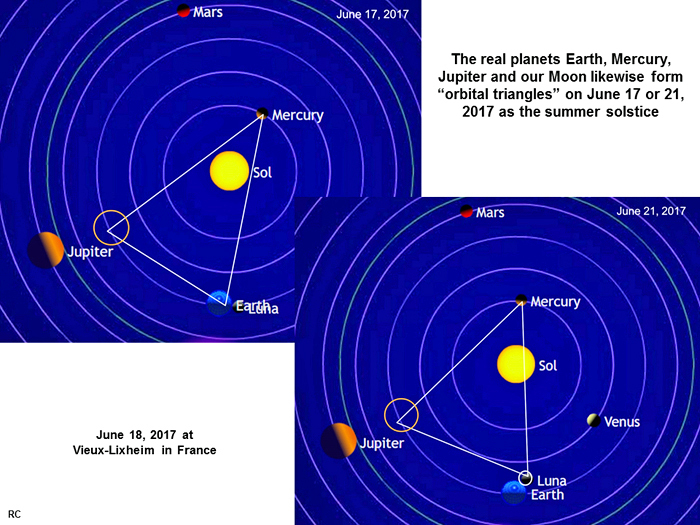 This year 2017 is a hundred-year anniversary of some great sky event over Fatima, Portugal on October 13, 1917, called “Miracle of the Sun”, which also involved a “radiant woman” who spoke to three children. 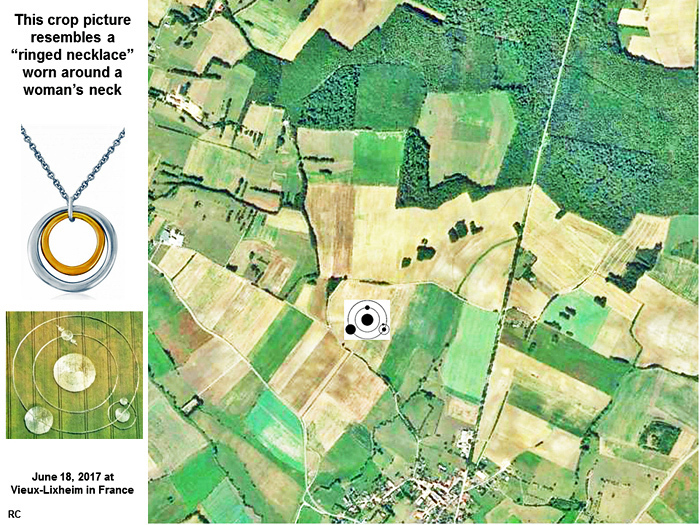 Three interesting landscape symbols from the metaphorical “chain” of that woman’s “necklace” seem to be “1-0”, which could mean decimal “10” or binary “2”, then “1-1”, which could mean decimal “11” or binary “3”, and finally a small capital letter “L” for “love”. 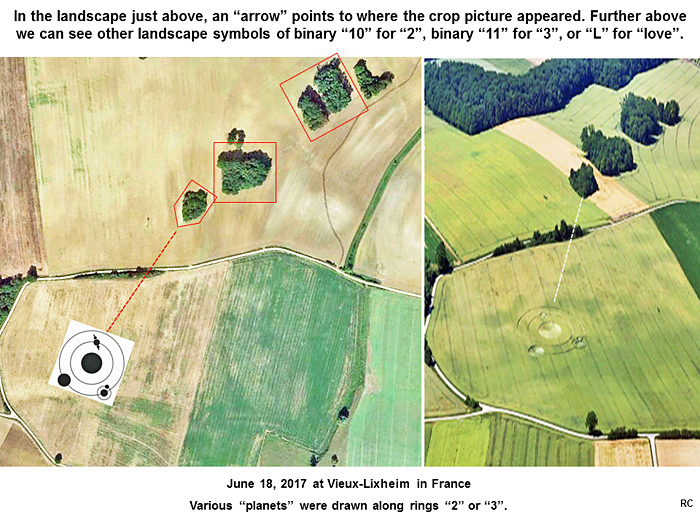 Three planetary symbols were drawn along rings “2” and “3” of this new crop picture, which seem to match binary symbols for “2” or “3” in the landscape just above. A similar landscape symbol of “1-0” for binary “2” was used at West Kennett, just three days later on June 21, 2017 (see West Kennett Comments).